To make the filling: Place dried mushrooms in a small bowl, and add 1 cup boiling water. Let soak until very soft, about 30 minutes. Strain mushrooms. Cover and chill soaking liquid (about 3/4 cup). Finely chop mushrooms, and combine with apples in a small bowl; set mixture aside. Meanwhile, blanch spinach in boiling salted water just until wilted, about 30 seconds. Using tongs, transfer to a plate and allow to cool entirely. Melt butter in a large skillet over medium heat. Add onion; cook, stirring often, until soft and lightly golden, about 8 minutes. Add mushrooms and apples; cook, stirring occasionally, until flavors meld, about 5 minutes. Stir in garlic, thyme, and rosemary; cook for 1 minute. Add brandy and cook until liquid is absorbed, about 1 minute. Stir in 2 teaspoons salt and 1/2 teaspoon pepper. Transfer mixture to a bowl and let cool completely. Add ground sausage and stir to combine well. To prepare the pork: to butterfly, put pork loin on a work surface with short end facing you. Holding a long, thin sharp knife parallel to work surface and beginning along one long side, cut 1/2″ above underside of roast. Continue slicing inward, pulling back the meat with your free hand and unrolling the roast like a carpet, until the entire loin is flat. Cover with a sheet of plastic wrap. Using a meat mallet, pound to an even thickness. Uncover pork. Season with 1 teaspoon salt and 1/2 teaspoon pepper. Place spinach on top of loin in an even layer, overlapping as needed and leaving a 1″ border. Spread filling on top of kale. Roll pork into a tight cylinder. Wrap one layer of prosciutto around roast. Tie roast securely with kitchen twine in 1″ intervals. Tuck rosemary sprigs under twine, spacing apart. 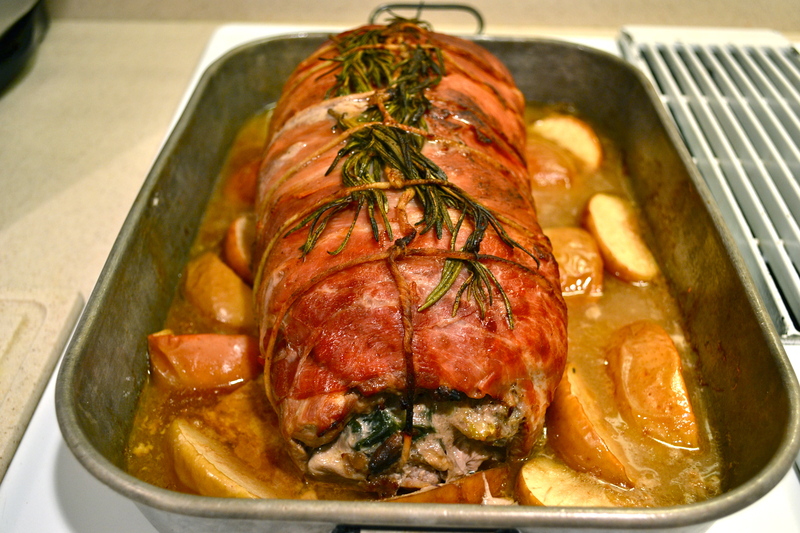 DO AHEAD: Pork roast can be made 1 day ahead. Cover and chill. Let stand at room temperature for 1 hour before continuing. To cook the stuffed loin: Preheat oven to 400°F. Place apples in a roasting pan. Melt 1 tablespoon butter with oil in a large skillet. Brown pork on all sides, about 5 minutes total, then set on top of apples in pan. Add cider and chicken stock to skillet; bring to a boil, scraping up browned bits. Pour mixture into roasting pan. Roast pork for 30 minutes, then lower temperature to 365°F – continue roasting until an instant-read thermometer inserted into center of loin registers 140°F (it will be cooked medium but still slightly pink), about 1 hour. Let roast rest for at least 20 minutes and up to 2 hours. Put roast on a platter. Reserve apples from roasting pan; spoon off fat from juices in pan. Place pan on top of stove over medium-high heat. Pour in reserved mushroom liquid, leaving any sediment behind, and cook, scraping bottom of pan to release any browned bits, until slightly thickened, about 5 minutes. Whisk in remaining 2 tablespoons butter and season to taste with salt and pepper. Strain sauce; slice pork. Serve sauce and apples alongside sliced pork.